What is the Pastor to be? Comments Off on What is the Pastor to be? Today’s pastor wears many hats. Some of these hats are appropriate, aligning with the New Testament’s expectations for the pastorate. Yet many are unhealthy, burdensome expectations imposed by the congregation—or even by the pastor himself. In any case, the 21st century pastorate can be a daunting position to hold. The biblical expectations are high, and the nonbiblical ones held by many churches are higher still. No pastor is omni-competent, and none can be omnipresent. Yet today’s pastor is often expected to be both. He preaches only 20 minutes but thoroughly expounds the Word. He condemns sin but never hurts anyone’s feelings. He works from 8 a.m. to 10 p.m. doing every type of work, from preaching in the pulpit to janitorial work. He makes $100 a week, wears good clothes, buys good books regularly, has a nice family, drives a nice car, and gives $50 a week to the church. He stands ready to give to any good cause, also. His family is completely model in deportment, dress, and attitude. He is 26 years old and has been preaching for 30 years. He is tall, short, thin, heavyset, handsome, has one brown eye and one blue eye, hair parted in the middle, left side dark and straight, right side blond and wavy. He has a burning desire to work with teenagers and spend all of his time with the older people. He makes 15 calls a day on church members, spends all his time evangelizing the unchurched, and is never out of the office. While this parody obviously overstates expectations, in some churches it may hit eerily close to home. During times of transition, churches often conduct congregational surveys to determine what the church should look for in their pastoral candidates. I’ve reviewed more than a few of these. The results are, much like this spoof, often somewhere between comical and maddening. But, what is the pastor to be? What must the pastor do? For these answers, we must turn to the Scriptures. That is the primary aim of my new book, Portraits of a Pastor. 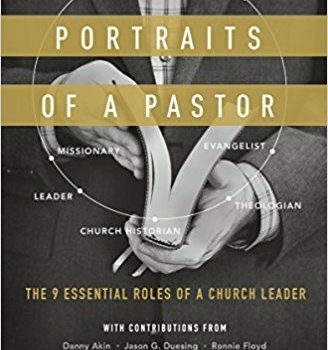 Within these pages, you’ll find the pastorate presented in full color as we consider the pastor as: leader, missionary, evangelist, apologist, theologian, church historian, shepherd, father, and husband. The book is both biblical and practical, so that you might more faithfully, and more effectively, serve the local church. Over the years, I have pastored several churches and served several others in various roles. Thankfully, my experiences have been good ones with supportive, loving congregations. Now I find myself one step removed, serving as a seminary president, where my responsibility and joy is to train ministers for church service. I consider my calling a high one, but only because I’m in the position of helping to prepare men for an even higher calling: pastoring a local church. It’s a calling one should seek to fulfill with maximum faithfulness. And to do that, you must look to one and only one place for guidance—the Word of God.